I love it when friendships and social media create new connections! 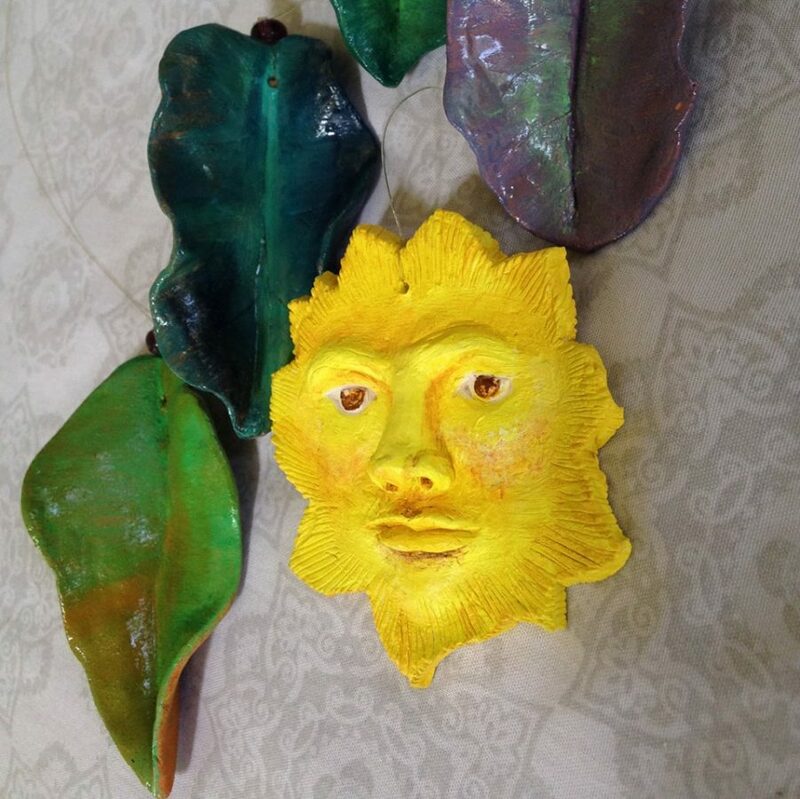 During a recent Skype conversation with an ole Trini pal of mine, I heard about Debra Evans’ creations. Then, on Instagram, I saw some of her work for Elysian Charms & Carvings. The tropical themes enchanted me. Her pieces would bring joy to any given space. So, I decided to introduce Debra to you, my readers. Debra Evans is based in Trinidad and this is her interview. DE: My name is Debra Evans. I live in beautiful Maraval in Trinidad… and I’m an artist. I’m an animal lover and love all of nature with the exception of something starting with L and ending with izards. I have an extensive background in advertising and print but my real passion is creating 3D art. My career in advertising included design and illustration for a mostly corporate clientele. This formed the design aspect of my studio Design Workshop for the past 20 years. My father is an artist and was very involved in Carnival costume design and construction for many years, and I continued that tradition. The other side of Design Workshop is the more creative one where I can produce and flow to create whatever I want. Working with clay, fabric, wire, wood etc. is very liberating to me. Each piece I create is unique, totally my style. TTT: What was the catalyst for starting Elysian Charms & Carvings? DE: In the past the focus was on my corporate work and I felt a deep longing to release my creative energy. I started making unusual art pieces which I would gift to my closest friends. What I wanted was a way to remind them of how loved they are. They showed tremendous appreciation for the time and effort that went into these pieces BUT they also felt I had a gift to share with the world. You see, each piece is not just a sample of ‘pretty art’. I called it Elysian Charms and Carvings because in creating them, I am so serene. In this almost meditative state, while often painstaking, the work seems like a joy – smooth, delicate… divinely inspired. During the process I choose powerful words like love, confidence, calm, trust, faith etc. and write them on the wood or clay. My intention is to imbue the piece with the power of those words, making it not just something decorative, but changing it into a talisman. The idea is that Elysian art with help to bring and keep an aura of harmony to your space. TTT: What inspires your work? DE: What inspires my work is the need to create MEANINGFUL art, to add value. I know our lives are so filled with challenges and stress and we every so often need to centre or ground ourselves. I want my pieces to be a part of that process. I wish to create beautiful work that you WANT to look at and touch and which will help you to feel soothed and comforted. I see beauty everywhere, even where there’s pain. I am a firm believer in the ‘No mud no lotus’ school of thought. TTT: What stores would you like to see your products stocked in? DE: Since I would like to always maintain the hands on approach to my work, I would prefer to market my pieces online. A few esoteric stores in Trinidad currently carry my work. My intention is to create and sustain a line of work that allows me to produce by orders placed online, from either my Facebook page or Instagram account. Elysian Crafts and Carvings by its definition is not a service that lends itself to mass production. There is also the flexibility I offer where custom designs can be done. TTT: How can customers from overseas make a purchase? DE: Elysian art is visible online at deedotevansartist on Instagram and on my facebook Debra Evans. Anyone interested can view the pieces I offer and make a selection or place a special order. Payments are arranged via a Pay Pay account or simple wire transfer. Depending on the complexity, it usually takes 2 weeks for your pieces to be completed and shipped to you. It’s that easy! DE: Yuh is ah true Trini fuh true if no matter where you roam, memories of Rudder, pink and yellow Poui on the hillsides and a Maracas bake and shark always make you long for home! I love that you both are about doing your own thing with generosity and grace. Aww thank you Zoe!! Thanks for stopping by. I’ve been fortunate enough to have my Elysian wind chime adorn my Japanese maple tree in SW Virginia. It has seen Fall, Winter and now Spring. 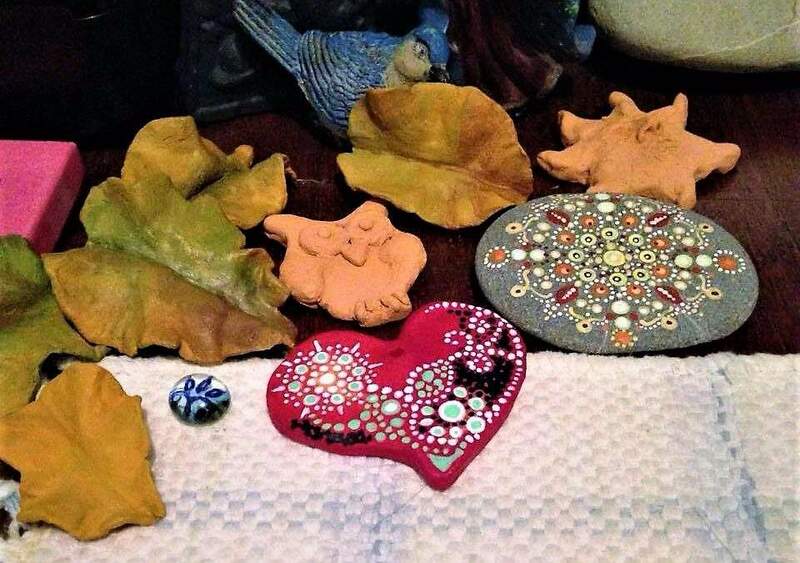 The birds, squirrels, changing leaves and seasons have all welcomed my darling chime’s presence and its imbued sentiment kneaded into the potter’s Clay certainly has brought a zen quality to my quiet, meditative space. Should you ever meet its creator, you will be doubly blessed for Debra is one of the ‘good ones’. A keeper as we like to say here in the South. Congratulations DE. Bravooooo to a lovely and informative interview. Thanks awesome Judy. Her work took my breathe away, the colours really pop and give a flavour of the Caribbean. Its great to hear from a happy customer. Debra, the pleasure was mine. Your work deserves to be seen and cherished. Best wishes, M.